In March of 1883 the Silver Queen statue arrived by rail in Aspen from Pueblo where sculptor Hiram L. Johnson built the art piece. Teams of horses hauled her crated parts up a very muddy Mill Street and then to the Armory building (today’s Aspen city hall) from the Denver & Rio Grande Railroad terminal, where today’s Rio Grande field is. Professor Ives’ orchestra played to a gala unveiling as a Miss Tempie Brown pulled the curtain off the Goddess of Fortune and 200 small electric lights illuminated the piece. After a week-long exhibition the Queen was shipped to the Chicago World’s Fair — never to return. A view of the Silver Queen, lying on her back across Aspen Mountain, her head to the right, formed by Shadow Mountain. Tree growth, rock erosion, and private properties make finding the ideal view in 2016 more difficult than in years past. ASPEN – Just as the name Aspen was lifted from the tree to name our town in 1880, and then from our notoriety to name the Dodge Aspen car in 1976, the Aspen Soda in 1978, and the 1989 Aspen Cologne, so has our one-time Victorian nickname, the “Silver Queen City,” served as a moniker theme to many things. But what is the origin of this royal title? A look back to when Aspenites’ memories of our heritage percolated closer to the surface offers some answers. The original Silver Queen appellation was first coined in the 1880s by town pioneers who saw her reclining in West Aspen Mountain, now more commonly known as Shadow Mountain, from across the way on Red Mountain, much like the Sleeping Indian in Jackson Hole. Yet the same Silver Queen profile, with her distinct nose and face pointing skyward, her flowing hair descending the north-facing Shadow Mountain escarpment, and body extending into Ruthie’s Run, was also known — and probably seen by the valley’s first native residents — as the Ute Chief. With a slight mind toggle, we can easily see a distinguished Ute profile with his full headdress in the rocks sloping toward the Hickory House. Though the queen’s silhouette is emblematic of our mining era and has served that concept as a view of history wherein white pioneers conquered the wilderness and named things after themselves, perhaps recognition of the Ute Chief’s first rights to the profile is overdue — or, in these perilous times, the two are a blend of racial unity. The Silver Queen rests on Aspen Mountain in this 1895 photo. The wide street in the middle of town is Center Street (now Garmisch Street), which points directly toward a good viewing spot of the queen from Red Mountain. Aspen Street is to the left of Center Street. Viewed from Red Mountain, the Silver Queen lies in Aspen Mountain with her face looking to the sky from Shadow Mountain. 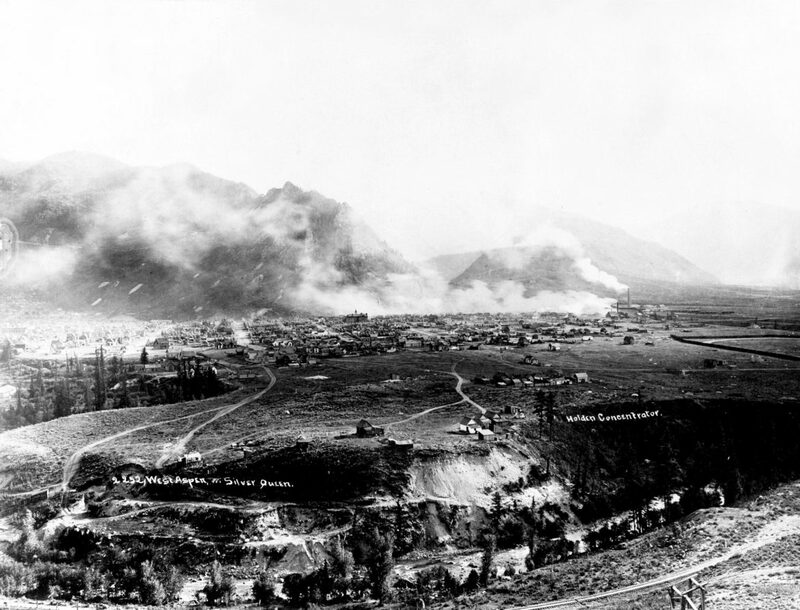 Smoke from the chimneys of the Holden Lixiviation plant that is processing silver ore from her veins surrounds her in 1892. In any case, there are different north-to-south locations from which to view the Silver Queen, but due to rock erosion and tree growth she remains more elusive than in the 1890s when Aspen Mountain was denuded of trees for mining timber. As we can see from the photographs, the trick is to find the ideal location where the best angle lines up the Shadow Mountain rocks for maximum recognition. The easiest spot to see her is to go up the first steep hill on Red Mountain where the “gold chains required” sign stood in the 1980s. Then proceed up and around the first bend to the straighter stretch of road, but not too far. If you can orient farther west between private property obstacles, but not as far as the Sunny Side trail, the perfect modern view is still there to be found. Another approach to this royal hunt is to line up Garmisch Street with Red Mountain and then root around up there opposite town. This ideal angle is definable in the old photos at the Aspen Historical Society (aspenhistoricalsociety.org—photo gallery). In their selection of pictures, Center Street — renamed Garmisch Street in 1966 when Garmisch-Partenkirchen became Aspen’s first sister city — points toward the ideal viewing spot on Red Mountain. In March of 1883 the Silver Queen statue arrived by rail in Aspen from Pueblo where sculptor Hiram L. Johnson built the art piece. Teams of horses hauled her crated parts up a very muddy Mill Street and then to the Armory building (today’s Aspen City Hall) from the Denver & Rio Grande Railroad terminal, where today’s Rio Grande field is. Professor Ives’ orchestra played to a gala unveiling as a Miss Tempie Brown pulled the curtain off the Goddess of Fortune and 200 small electric lights illuminated the piece. After a weeklong exhibition the queen was shipped to the Chicago World’s Fair — never to return. With the queen’s majestic presence reigning over the original mining camp, silver mining peaked between 1888 and 1893, when Aspen mines provided one-sixteenth of the world’s silver. 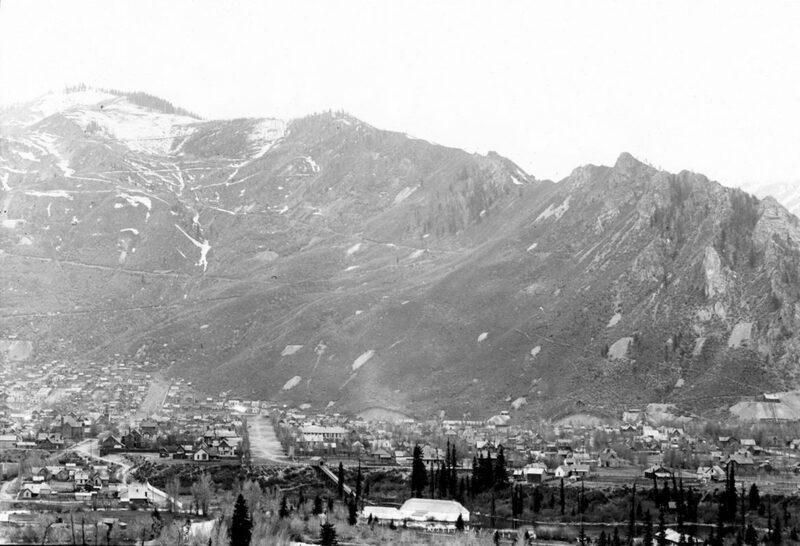 Local newspapers proudly referred to town as the “Silver Queen of the world” or “Silver Queen of the West.” But after the presidential election of 1892, Aspen’s livelihood was threatened by talk that President Cleveland would demonetize silver and side with Eastern bankers who wanted gold to be the single monetary standard instead of both gold and silver. In a symbolic appeal to promote her silver interests against this outcome, all of Aspen chipped in to commission sculptor Hiram L. Johnson of Pueblo to build a Silver Queen statue to represent their cause at the 1893 World’s Fair in Chicago. The art piece cost $10,000 to build ( $250,000 today). The colossal, ornate, silver-laden figure depicted an idealized 17-year-old woman — the same age as Colorado’s statehood — in a chariot-like boat, escorted by a Plutus on either side, one spilling silver coins and the other gold coins from cornucopias. (Plutus was the Greek god of wealth who Zeus blinded so as to give out wealth indiscriminately.) The figure was shipped to Chicago in March of 1893, but mysteriously vanished after the fair. The abundant ore from the prominent Aspen mines and the mixed coins in the sculpture represented the rising Populist Party’s demand to use both metals for coinage. At the same time, swelling national protests by an alliance of farmers, industrial workers, and silver mining interests blamed poor economic conditions on government mismanagement. 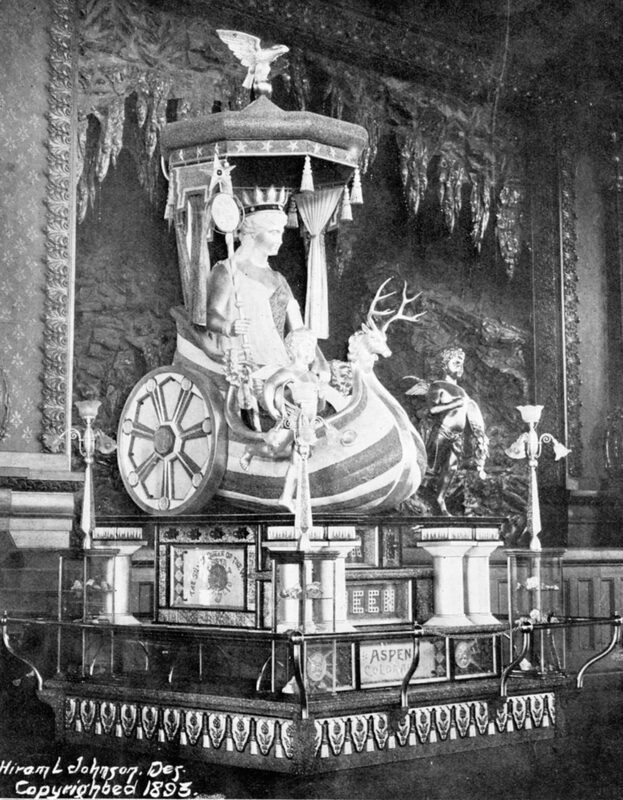 The Silver Queen statue on display at the Pueblo Mineral Palace in 1893 before being shipped to Aspen for viewing and then on to the Chicago World’s Fair. The queen’s disappearance after the fair has been an Aspen mystery to this day. Some legend says that the Silver Queen found its way back after the fair to the Pueblo Mineral Palace — a gigantic Egyptian-themed showcase for the mining industry — where it stood until 1942 when the indebted, ramshackle building was razed. 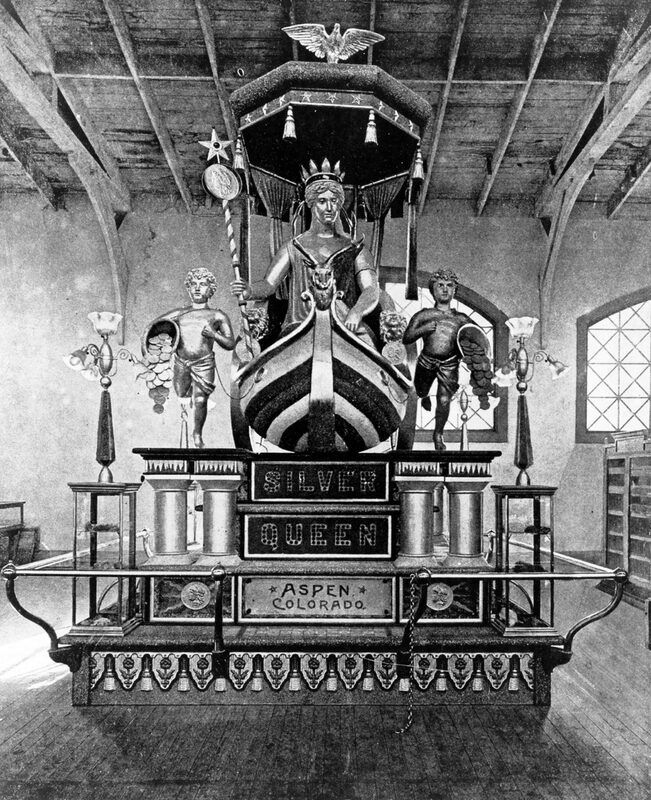 Yet the 18-foot-tall, 10-by-12 Silver Queen that visited Aspen by rail in March of 1893 and went on exhibition in Armory Hall (today’s City Hall) with much fanfare, before being crated and forwarded to Chicago, had an “intrinsic value of $20,000” ($500,000 today), said the March 22, 1893, Aspen Evening Chronicle. With a national economic contraction gaining steam in the summer of 1893, which sent Aspen into a tailspin that fall as the price of silver dropped, the original Silver Queen was probably abandoned in Chicago. According to past researchers no return shipping receipts are on record. A probable answer to the Silver Queen mystery was that the valuable parts of her fell prey to interlopers in Chicago, possibly during a catastrophic fire at the fair — though not in the grand mining pavilion — which killed 16 firemen that July. At some point, what was left of her may have returned to Pueblo to be later refitted with nonvaluable parts; or, sculptor Johnson had made a plaster prototype during her inception before fashioning the final metal Silver Queen, and that went on display in the Palace after the fair. Adding to the intrigue, the Aspen Times wrote on July 16, 1907, that Johnson had died in Chicago in 1893 while the Silver Queen was on display. This fact footnoted the reporting that Johnson’s widow, Dr. L. Carrie Johnson, had just been released in poor health at age 63 from the Canon City penitentiary after serving three years of a 20-year sentence for murder of another physician in Pueblo. 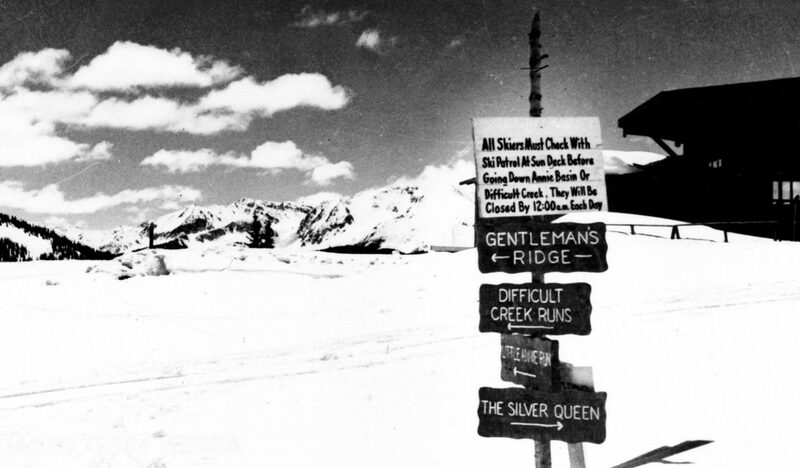 A sign at the top of Aspen Mountain in 1950 shows the Silver Queen trail starting atop Aspen Mountain. The trail went down Buckhorn, across Midway Road, down International, and down what is today’s steep Silver Queen run on lower Aspen Mountain. The sign says “All skiers must check with ski patrol at Sundeck before going down Annie Basin or Difficult Creek. They will be closed by 12:00 each day.” The first version of the Sundeck, known as the Octagon, is partially visible behind the sign. 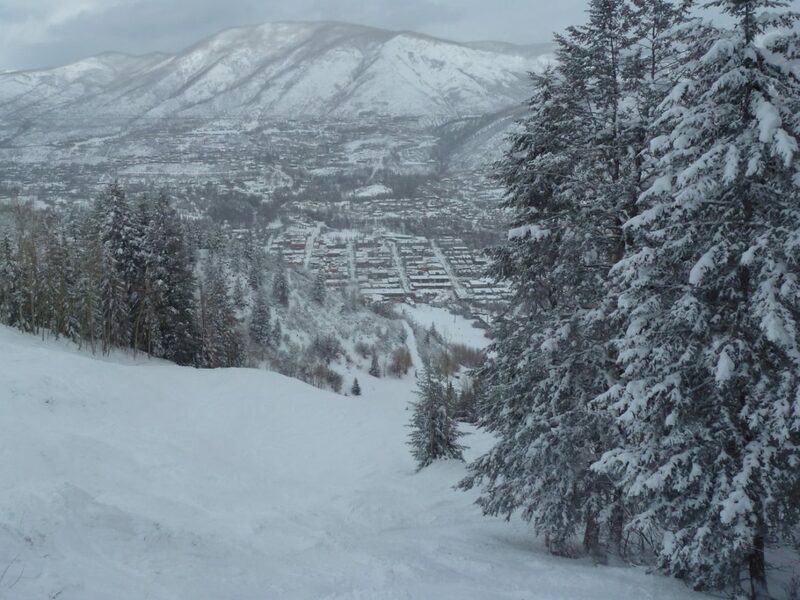 Another prominent Silver Queen that is fortunately still in our midst is the ski run on Aspen Mountain. The Nov. 15, 1945, Times reported that Friedl Pfeifer, then head of the Aspen Ski School before the formation of the Aspen Skiing Corporation in 1946, announced that the lower Silver Queen trail had been cut. This was accessible via a walk up what is now Tower Ten Road from the top of the boat tow, which ended at the bottom of today’s Corkscrew. For that winter, the Silver Queen trail extended from today’s top of Little Nell down. That means that the original Silver Queen trail continued up Ajax Hill — the topmost knob of Aspen Mountain where the Sundeck stands — via the “Buckhorn slope.” Subsequently, portions of that original top-to-bottom Silver Queen trail were renamed, and the Queen became the shorter, steeper run that we know today. A view down the Silver Queen trail toward downtown Aspen. Still iconic, if shorter than before. In 1902 editions of the Aspen Democrat, Durant’s grocery offered Silver Queen whisky at $1.25 a bottle and Cain’s market sold Silver Queen flour for $2.50 per 100 pounds. The March 1919 Democrat-Times listed the Silver Queen mine up Sandy Gulch in Castle Creek, which was part of the Highland mining district along the Little Annie side of Aspen Mountain. In 1909, the Aspen High School published its first yearbook, calling it “The Silver Queen.” Alumni dating back to 1889 were listed in the back. From then on the yearbook was called The Silver Queen. But interest in that name as a tradition for the book dropped away after the 1996 edition. The collection is viewable on the Aspen Historical Society’s website. On March 28, 1946, the Times reported that John Litchfield bought the Brick Saloon — aka Tim’s Place — from Tim Keller and Tom Lotta, and named it the Silver Queen Club. But soon after, Litchfield renamed it the “Red Onion,” which in the lingo of the day meant something odd or out of the ordinary. Then there was the short-lived Silver Queen restaurant in the Hotel Jerome in the ‘70s run by Jon Carter and Dennis Langford, two still-surviving witnesses to that unapologetic decade. A picture of the statue decorated the menus and gourmet food was served with local attitude. 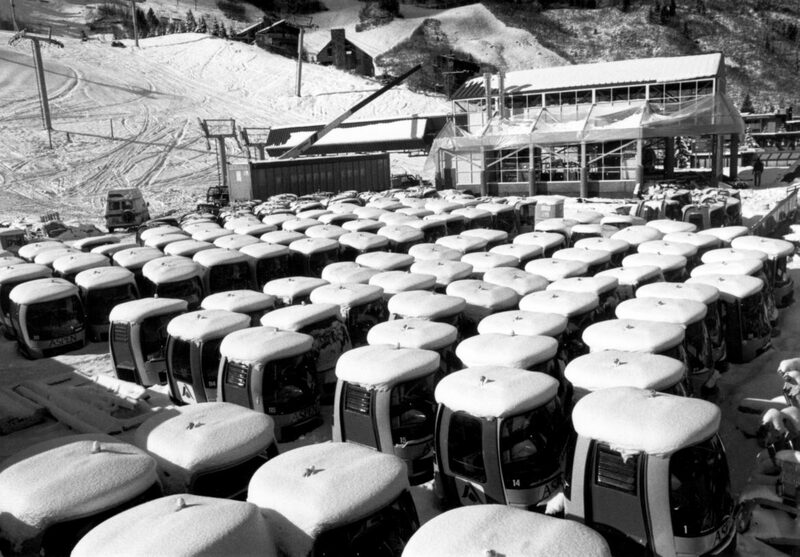 Rows of snow-covered cabins wait to be put on the cable before the opening of the Silver Queen Gondola for the upcoming 1986-’87 ski season. The “clam shell” cars were the predecessors of today’s cars, which have the seats facing inward. The photo is dated Nov. 13, 1986. 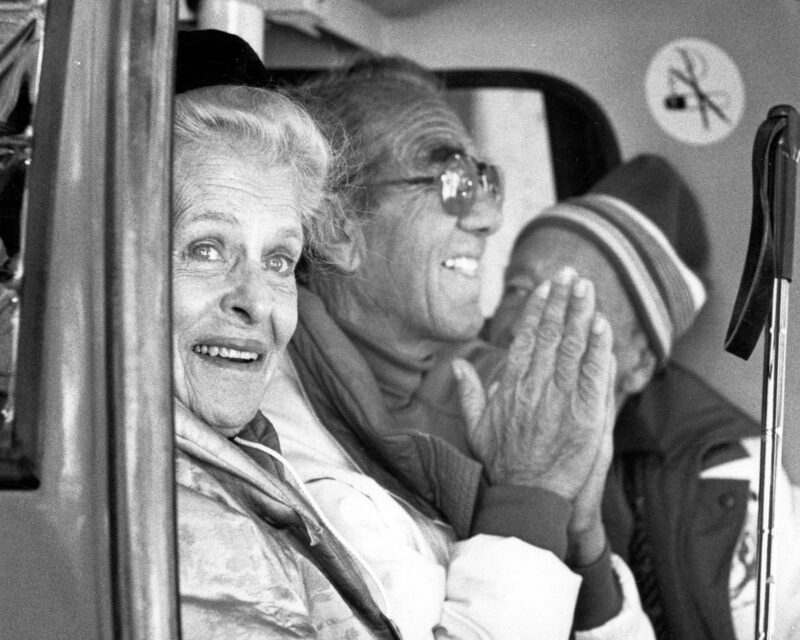 Aspen patron and grand dame Elizabeth Paepke and Aspen Ski Corporation founding member Friedl Pfeifer riding up the Silver Queen Gondola on Jan. 16, 1986, during the official inaugural ceremonies. The gondola opened for the season in December of 1986. And finally, there is the monumental Silver Queen Gondola on Aspen Mountain. 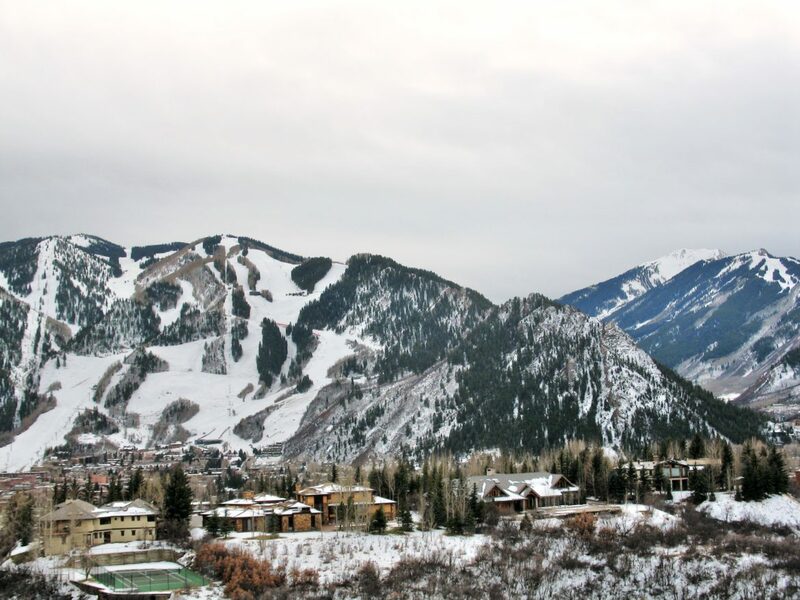 Opening for the winter in 1986, the high-capacity ski lift brought record skier numbers to Aspen Mountain along with several decades of accelerating growth in the valley. Coincidentally, a previous historical marker 100 years before, in the form of the settlement of Aspen’s nationally watched Apex-Sideline court case — a dispute that determined boundary ownership of ore that originated near today’s Silver Queen run — set off Aspen’s first wave of prosperity, along with the silver rush that attracted swarms of miners to Aspen Mountain. Editor’s note: Tim Cooney, a freelance writer and veteran Aspen Mountain ski patroller, is collaborating with Aspen Journalism and the Aspen Daily News to explore Aspen history. The Daily News published this story on Sunday, Nov. 27, 2016.